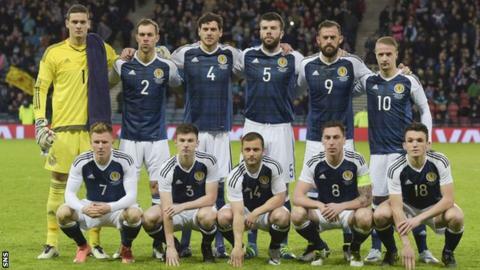 Scotland recorded their second single-goal win within five days as Matt Ritchie's early strike was enough to beat Denmark at Hampden Park. Ritchie pounced after Daniel Agger hesitated following a through ball from Scott Brown and the winger steered it wide of goalkeeper Kasper Schmeichel. Denmark, looking for a second successive win under new coach Age Hareide, had the better of the game. But several excellent saves from Craig Gordon prevented an equaliser against a Scottish side with a completely new starting line-up to the one that won in the Czech Republic. Former Scotland defender Willie Miller, who won 65 caps from 1975 to 1989, was at Hampden Park and here he gives his marks out of 10 for each of the Scotland players. The Celtic man was not tested too much, but it is a mark of a good international goalkeeper when he makes saves when called upon and he had three or four, including a great double stop to deny Martin Braithwaite. He started off brightly, but his runs forward quickly dried up. He hasn't been playing much for Norwich City and it showed, especially in the second half. The Celtic 18-year-old was very good in the early stages of his debut before Scotland started to get pinned back. He only played the first half because Gordon Strachan brought on Charlie Mulgrew for his extra height, but Tierney will have done his international future a lot of good. Apart from Tierney, I don't think the back four played well as a unit and were fortunate not to be breached. Greer has not played a lot of football for Brighton and it showed, with the Danes being able to create too many chances. The Blackburn Rovers centre-half has a good attitude and, as usual, was up for the battle, but at international level you have to think a bit more than he did on the night. I thought the Bournemouth man gave the ball away too much and, as a winger, I would want him more involved further up the pitch. But he put in a good shift and he took his goal well. I thought the Celtic captain was not as influential as he has been and found it difficult to control the midfield. However, he had to guide young John McGinn through his debut and he played a captain's role. The Hibernian midfielder was Scotland's star man on his international debut. The 21-year-old was fabulous, showing a positive attitude and always trying to make passes that meant something. He is definitely one for the future if he continues to progress. The Hull City winger was not as influential as he is capable of, but that was largely down to the team being forced to defend, although his set-pieces were decent as ever. He is normally an out-and-out striker with Sunderland and now on loan to Marseille and playing just behind Leigh Griffiths is not his position, so Scotland were being overrun in that area of the park. The Celtic striker has waited a long time for his chance to start up front, but he received no service whatsoever and he was a lonely figure. The Watford winger scored the winner in the Czech Republic last week and he was quite bright when he came on again with his perkiness and directness. The Celtic defender gives you composure at the back and is never flustered. On this occasion, he replaced Kieran Tierney at left-back to combat Denmark's aerial power and did well. The midfielder on loan to Leeds United from Sunderland did not have time to make much of a contribution other than a terrible tackle on Erik Sviatchenko. It was uncalled for in a friendly international and could have left the defender badly hurt. In the short time that he was on the pitch, the Derby County striker took up more threatening positions than Griffiths and Fletcher had before him and showed that he is a poacher. The 18-year-old Nottingham Forest midfielder was only on the field for a matter of minutes but had one strong run that almost led to a goal for Chris Martin. Willie Miller was talking to BBC Scotland's Clive Lindsay.